And I’m pretty good at it too, or at least I think I am, anyways. Not to toot my own horn or anything, but I take pride in finding just the right gift for each person on my list. Which is why I often start shopping early; it gives me the time to get exactly what I want at the right price (without having to put up with any of that Black Friday nonsense, which frankly, I find a little disgusting). Another thing that helps me accomplish my gifting goals is the great variety of brick and mortar shops and online stores at hand. I have several go-to “stops” that rarely fail me, and that actually make shopping for that special item fun and relatively stress free. Which is how gift shopping should be, in my opinion; not a mad dash or crazy frenzy that makes it a chore or an obligation instead of a thoughtful gesture for someone you care about. So because it’s the middle of shopping season, and that holiday panic is rearing its ugly head just around the corner, I thought I’d share with you all some of my favorite places to shop, not just during the holiday season, but year-round – for others, and for myself! No one paid or endorsed me to write this post in any way, this truly is just a list of my top shops for gift giving! The Greater Good Network: Comprised of The Hunger Site, The Animal Rescue Site, The Breast Cancer Site, and much much more! For every purchase you make, sponsors donate to one of several fantastic charities. (over $29 million have been donated since 1999) – what could be better than giving two gifts for the price of one? I wrote an entire post about The Greater Good Network of sites and charities on Friday, so be sure to check it out to find even more about the program. No More Rack: There’s not a whole lot to say about NoMoreRack.com than drastically reduced prices and flat $2 shipping rates no matter what you order. Pretty much speaks for itself, right? Seriously, if you’re looking for a great deal on an expensive item, they’ve probably got it. Plus a lot of things sell in packs of multiples, so you can gift one and keep one, or get something for several people for the price of one present. Definitely a great place to check out when you’re on a budget. Oh, and the products are usually name-brand, so you’re cutting costs, never quality. Local Shops/Holiday Market: Let’s face it, most of the places you’ll shop this year are all going to be offering the same products at different prices. Which is fine if you’re getting someone the usual sorts of gifts – games, the latest tech gadget, clothes, music, movies – whatever. But when you’re looking for a more personal or unique item, local shops, boutiques, markets, and craft fairs are the perfect places to buy. On occasion these items may cost a little bit more if they’re hand made – but you’ll probably be surprised to find that you can pick up something one-of-a-kind for the same price you’d get a cookie-cutter copy from a box store. 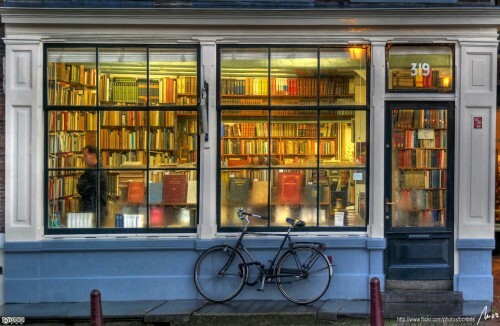 The Bookstore: Books are a HUGE present in my family. And by that I mean: we give a lot of books, and we’re all really excited to be on the receiving end of them, too. Some of the best presents we’ve received have been gift cards to Barnes & Noble, enabling us all to go on giant book buying binges as a family (and I mean giant). But even if your crowd isn’t a reading crowd (psh, what am I saying? Don’t buy those fools presents, go get a new crowd! !…JUST KIDDING!) bookstores still have a lot to offer – notebooks, board games, movies, CDs, and all sorts of randomness are to be found among the shelves as well, and they’ve usually got some creative gift ideas! The Mall: I know, I know, kinda weird because I panned “big box stores” above, and although malls aren’t technically box stores, they are giant boxes with stores in them, and basically the hub of all things commercial. But still – malls do have their time and place! Personally, my favorite places to stop by are J C Penney, American Eagle, The Hallmark Store, Things Remembered, and Game Stop – but they’ve also got bookstores, jewelry stores, and Hickory Farms is always going in the winter time. Realistically, if you shop long enough, you can probably get something for everyone on your list in one outing. The mall is still probably where I make the least amount of my holiday purchases, however. Online/Catalogs: I guess that’s a pretty vague, catch-all category title, and maybe I got lazy, but I actually don’t do a significant amount of shopping online other than the sites I mentioned above – though I still do enough that it shouldn’t go unmentioned. Obviously Amazon is a big one, and I definitely get a few gifts from the site each year (to make each Amazon purchase really count, buy from smile.amazon.com and a portion of your purchase will go to charity), as well as their partner site MyHabit. Despite the name Femail Creations actually has some really fun stuff for men and women in their catalog as well as online – and I get a few other random catalogs for shops whose names I can’t even remember at the moment, but whose pages get dog-eared and stacked in a pile to be ordered from when the time comes. Bambeco Nature Conservancy Holiday Gift Guide: Any purchase made from Bambeco’s holiday gift guide between now and January 15th will go to support the Nature Conservancy’s efforts across the world. Like I said, I haven’t purchased anything from the guide, or even the site, yet – but I’ve looked through everything and there are tons of great, eco-friendly products for just about everyone on your list! I’m super excited to have discovered a new shop this year! There you have it – I hope you enjoyed my top 6 holiday shopping stops, and maybe even found a couple of new options for yourself this year! Good luck checking those names off your list this holiday season! What are some of your go-to Holiday Shopping Stops? On line because I can find some really unique gifts for each person’s individuality.